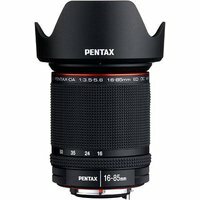 The Pentax 16-85mm f3.5-5.6 ED DC WR HD DA lens with ultra-wide-angle to telephoto zoom range (24.5-130mm in the 35mm format) is for use with Pentax K-mount DSLRs and ideal for a range of photographic subjects. This versatile, weather-resistant (WR) lens comes in handy for a variety of scenes and subjects, including sweeping landscapes, architecture, travel and portraiture. This lens is treated with the high-grade, multi-layer High Definition (HD) Coating to ensure higher light transmission and less reflection to deliver bright, flare-free images full of contrast and detail.